Laos ((, , , or ) Lao Language: ສາທາລະນະລັດ ປະຊາທິປະໄຕ ປະຊາຊົນລາວ, pronounced Sathalanalat Paxathipatai Paxaxon Lao), (French: République démocratique populaire lao), officially the Lao People's Democratic Republic, is a landlocked country in Southeast Asia, bordered by Burma and the People's Republic of China to the northwest, Vietnam to the east, Cambodia to the south, and Thailand to the west. Its population was estimated to be around 6.5 million in 2012. A third of the population of Laos live below the international poverty line (living on less than US$1.25 per day). Laos has a low-income economy, with one of the lowest annual incomes in the world. In 2013, Laos ranked the 138th place (tied with Cambodia) on the Human Development Index (HDI), indicating that Laos has lower medium to low development. According to the Global Hunger Index (2013), Laos ranks as the 25th hungriest nation in the world out of the list of the 56 nations with the worst hunger situation(s). Laos has had a poor human rights record most particularly dealing with the nation's acts of genocide being committed towards its Hmong population. Laos' strategy for development is based on generating electricity from its rivers and selling the power to its neighbours, namely Thailand, China, and Vietnam. Its economy is accelerating rapidly with the demands for its metals. 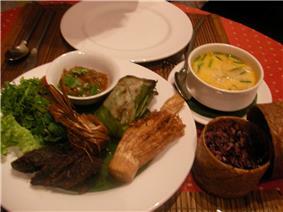 ^ a b c d Laos. CIA – The World Factbook. Cia.gov. Retrieved on 27 January 2013. ^ a b c "Background notes – Laos". US Department of State. Retrieved 20 January 2012. ^ a b c d "Report for Selected Countries and Subjects". World Economic Outlook Database. ^ These same pronunciations using WorldHeritage's pronunciation respelling key: , , , . ^ "Definition of Laos from Oxford Dictionaries Online". Oxford Dictionaries. Retrieved 24 July 2011. ^ "Laos – Definition and More from the Free Merriam-Webster Dictionary". Merriam-webster.com. Retrieved 24 July 2011. ^ "Laos: Human Development Indicators". undp.org. Retrieved 19 July 2013. ^ "Lao People’s Democratic Republic and the WTO". World Trade Organization. Retrieved 9 August 2014. ^ Kislenko, Arne (2009). 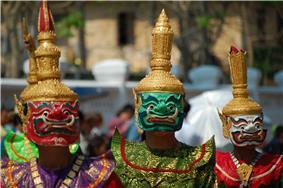 Culture and customs of Laos. ABC-CLIO. p. 20. ^ Hayashi, Yukio (2003). Practical Buddhism among the Thai-Lao: religion in the making of a region. Trans Pacific Press. p. 31. ^ "[Demeter F. et al., Anatomically modern human in Southeast Asia (Laos) by 46 ka http://www.ncbi.nlm.nih.gov/pubmed/22908291/]", PNAS, 4 September 2012. 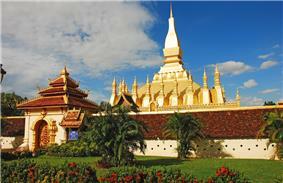 ^ "Facts on Laos". Laos National Tourism Association. Archived from the original on 4 March 2011. Retrieved 24 December 2011. ^ "Let's hope Laos hangs on to its identity". Asianewsnet.net. Retrieved 23 January 2011. ^ Cummings, Joe and Burke (2005). Laos. Lonely Planet, Andrew. pp. 23–. ^ MacKinnon, Ian (3 Dec 2008). "Forty years on, Laos reaps bitter harvest of the secret war". The Guardian (London). Retrieved 7 May 2010. ^ a b Unrepresented Nations and Peoples Organization. "WGIP: Side event on the Hmong Lao, at the United Nations". Retrieved 20 April 2011. ^ Hamilton-Merritt, Jane (1999) Tragic Mountains: The Hmong, the Americans, and the Secret Wars for Laos, 1942–1992, Indiana University Press, pp. 337–460, ISBN 0253207568. ^ Al Santoli and Eisenstein, Laurence J. (1989). Forced back and forgotten: the human rights of Laotian asylum seekers in Thailand. Lawyers Committee for Human Rights. p. 8. ^ a b "Nsc Lao Pdr". Nsc.gov.la. Retrieved 21 January 2012. ^ "Laos Environmental problems & Policy". United Nations Encyclopedia of the Nations. Retrieved 20 April 2011. ^ "Energy & Environment for Sustainable Development". United Nations Development Programme. Archived from the original on 11 March 2008. Retrieved 20 April 2011. ^ Buncombe, Andrew (20 April 2011). "Mekong ecology in the balance as Laos quietly begins work on dam". London: The Independent. Retrieved 20 April 2011. 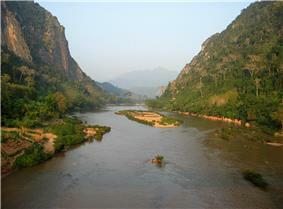 ^ "Vietnam worries about impacts from Laos hydroelectric project". Voices for the Laotian Who do not have Voices. Retrieved 20 April 2011. ^ Osborne, Milton (29 June 2011). "Mekong dam plans threatening the natural order". The Australian. ^ "U.S. furniture demand drives illegal logging in Laos". illegal-logging.info. Retrieved 20 April 2011. ^ "Illegal Logging Increasingly Prevalent in Laos". voanews.com. Retrieved 20 April 2011. ^ Laponche, Bernard et al. (2008). "Focales n° 8. Energy Efficiency Retrofitting of Buildings – Challenges and Methods" (PDF). afd.fr. Retrieved 17 February 2011. ^ "Lao Defense Chief Among Plane Crash Victims". Laos News.Net. Retrieved 17 May 2014. ^ a b The Times (30 July 2006). "No way out". London. ^ "Laos agrees to voluntary repatriation of refugees in Thailand," U.P.I., 5 June 1991. ^ "Lao Refugees Return Home Under European Union Repatriation Program," Associated Press Worldstream, 22 11, 1994. Karen J, "HOUSE PANEL HEARS CONCERNS ABOUT HMONG," States News Service, 26 April 1994. ^ Mydans, Seth (28 December 2009). "Thailand Begins Repatriation of Hmong to Laos". The New York Times. Retrieved 4 May 2010. ^ a b "Thailand starts deporting Hmong refugees back to Laos". BBC. 28 December 2009. Retrieved 28 December 2009. ^ a b Amnesty International (May 2010). "Submission to the UN Universal Periodic Review: Eighth session of the UPR Working Group of the Human Rights Council". ^ AFP (15 April 2011). "Laos, Vietnam troops kill four Hmong Christians: NGO". ^ THOMAS FULLER (17 September 2009). "Communism and Capitalism Are Mixing in Laos". New York Times. ^ "A Race Against Time" (PDF). Archived from the original on 14 June 2007. Retrieved 27 June 2010. ^ Özden, Çaḡlar and Schiff, Maurice W. (2006). International migration, remittances, and the brain drain. World Bank Publications. ^ "Preparing the Cumulative Impact Assessment for the Nam Ngum 3 Hydropower Project: Financed by the Japan Special Fund" (PDF). Archived from the original on 15 May 2011. Retrieved 27 June 2010. ^ "Khmu people of Laos. OMF International". Omf.org. Retrieved 23 January 2011. ^ "Encyclopædia Britannica: Laos – Ethnic groups and languages". Britannica.com. Retrieved 23 January 2011. ^ "Human Development Report 2009 – Lao People's Democratic Republic". Hdrstats.undp.org. Retrieved 27 June 2010. ^ "Evaluation Synthesis of Rice in Lao PDR" (PDF). Archived from the original on 2 July 2007. Retrieved 27 June 2010. ^ "Lao PDR: Family Code". Genderindex.org. Retrieved 23 January 2011. ^ "Q&A with director Kim Mordaunt (The Rocket)". Melbourne International Film Festival. MIFF. August 2013. Retrieved 9 August 2013. ^ Marsh, James (26 September 2013). "Fantastic Fest 2013 Review: Chanthaly is A Haunting Portrait of Modern Day Laos". Twitch. Retrieved 15 May 2014. Association football has grown to be the most popular sport in Laos. The Lao League is now the top professional league for association football clubs in the country. Since the start of the League, Lao Army FC has been the most successful club with 8 titles, the highest number of championship wins. The martial art of muay Lao, the national sport, is a form of kickboxing similar to Thailand's muay Thai, Burmese Lethwei, Malaysian Tomoi, and Cambodian Pradal Serey. The largest stadium in Laos, New Laos National Stadium. Since the founding of the Lao PDR only very few films have been made in Laos. One of the first commercial feature length films was Sabaidee Luang Prabang, made in 2008. Australian filmmaker Kim Mordount's first feature film was made in Laos and features a Laotian cast speaking their native language. Entitled The Rocket, the film appeared at the 2013 Melbourne International Film Festival (MIFF) and won three awards at the Berlin International Film Festival. Recently a few local production companies have succeeded to produce Lao feature films and gain international recognition. Among them are Lao New Wave Cinema's At the Horizon, directed by Anysay Keola, that was screened at the OzAsia Film Festival and Lao Art Media's Chanthaly directed by Mattie Do, which was screened at the 2013 Fantastic Fest. All newspapers are published by the government, including two foreign language papers: the English-language daily Vientiane Times and the French-language weekly Le Rénovateur. Additionally, the Khao San Pathet Lao, the country's official news agency, publishes English and French versions of its eponymous paper. Laos currently has nine daily newspapers, 90 magazines, 43 radio stations, and 32 TV stations operating throughout the country. As of 2011, Nhân Dân (The People) and the Xinhua News Agency are the only foreign media organisations permitted to open offices in Laos—both opened bureaus in Vientiane in 2011. The adult  The National University of Laos is the Laos state's public university. The total literacy rate is 73% (2010 estimate). Of the people of Laos 67% are Theravada Buddhist, 1.5% are Christian, and 31.5% are other or unspecified (mostly practitioners of Satsana Phi) according to the 2005 census. 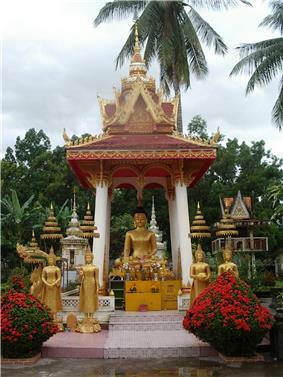 Buddhism has long been one of the most important social forces in Laos. 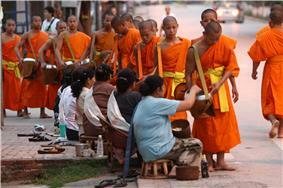 Theravada Buddhism has coexisted peacefully since its introduction to the country with the local polytheism. The official and dominant language is Lao, a tonal language of the Tai linguistic group. However, only slightly more than half of the population can speak Lao, the remainder speaking ethnic minority languages, particularly in rural areas. The written language is based on Khmer writing script. Languages like Khmu and Hmong are spoken by minorities, particularly in the midland and highland areas. A number of Laotian sign languages are used in areas with high rates of congenital deafness. 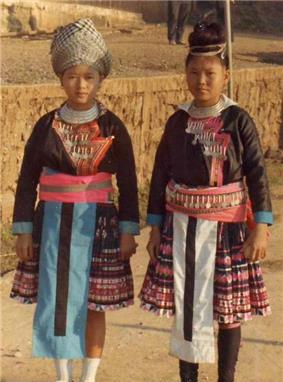 Hill people and minority cultures of Laos such as the Hmong, Yao (Mien), Dao, Shan, and several Tibeto-Burman speaking peoples have lived in isolated regions of Laos for many years. 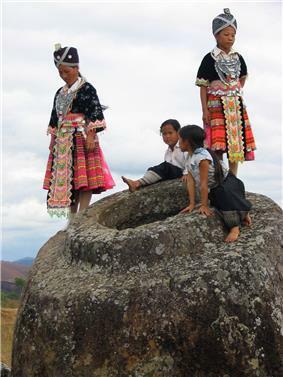 Mountain/hill tribes of mixed ethno/cultural-linguistic heritage are found in northern Laos which include the Lua and Khmu people who are indigenous to Laos. Today, the Lua people are considered endangered. 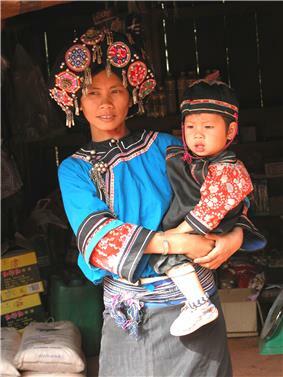 Collectively, they are known as Lao Soung or highland Laotians. Lao Soung account for only about 10% of the population. In the central and southern mountains, Mon-Khmer tribes, known as Lao Theung or mid-slope Laotians, predominate. Other terms are Khmu, Khamu (Kammu) or Kha as the Lao Loum refer to them as indicating their Austroasiatic origins. However, the latter is considered pejorative, meaning 'slave'. They were the indigenous inhabitants of northern Laos. Some Vietnamese, Chinese and Thai minorities remain, particularly in the towns, but many left after independence in the late 1940s, many of whom relocated either to Vietnam, Hong Kong, or to France. Lao Theung constitute about 30% of the population. More than half of the nation's population, 60%, is ethnic Lao—the principal lowland inhabitants, and the politically and culturally dominant people of Laos. The Lao belong to the Tai linguistic group who began migrating southward from China in the first millennium AD. 10% belong to other "lowland" groups, which together with the Lao people make up the Lao Loum. Laos' population was estimated at 6.5 million in 2012, dispersed unevenly across the country. Most people live in valleys of the Mekong River and its tributaries. Vientiane prefecture, the capital and largest city, had about 740,010 residents in 2008. The country's population density was 27/km2. Laos is known for its silk and local handicraft product, both of which are on display in Luang Prabang's night market, among other places. Another speciality is mulberry tea. The Lao National Tourism Administration, related government agencies and the private sector are working together to realise the vision put forth in the country's National Ecotourism Strategy and Action Plan. This includes decreasing the environmental and cultural impact of tourism; increasing awareness in the importance of ethnic groups and biological diversity; providing a source of income to conserve, sustain and manage the Lao protected area network and cultural heritage sites; and emphasising the need for tourism zoning and management plans for sites that will be developed as ecotourism destinations. Luang Prabang and Wat Phu are both UNESCO World Heritage sites, with the Plain of Jars expected to join them once more work to clear UXO has been completed. Major festivals include Laos New Year which is celebrated around 13–15 April and involves a water festival similar but more subdued than that of Thailand and other South-East Asian countries. The tourism sector has grown rapidly, from 80,000 international visitors in 1990, to 1.876 million in 2010. Tourism is expected to contribute US$679.1 million to gross national product in 2010, rising to US$1.5857 billion by 2020. In 2010, one in every 10.9 jobs was in the tourism sector. Export earnings from international visitors and tourism goods are expected to generate 15.5% of total exports or US$270.3 million in 2010, growing in nominal terms to US$484.2 million (12.5% of total) in 2020. The country's most widely recognised product may well be Beerlao which is exported to a number of countries including neighbours Cambodia and Vietnam. It is produced by the Lao Brewery Company. The economy receives development aid from the IMF, ADB, and other international sources; and also foreign direct investment for development of the society, industry, hydropower and mining (most notably of copper and gold). Tourism is the fastest-growing industry in the country. Economic development in Laos has been hampered by brain drain, with a skilled emigration rate of 37.4% in 2000. Through the development, release and widespread adoption of improved rice varieties, and through economic reforms, production has increased by an annual rate of 5% between 1990 and 2005, and Lao PDR achieved a net balance of rice imports and exports for the first time in 1999. Lao PDR may have the greatest number of rice varieties in the Greater Mekong Subregion. Since 1995 the Lao government has been working with the International Rice Research Institute of the Philippines to collect seed samples of each of the thousands of rice varieties found in Laos. Subsistence agriculture still accounts for half of the GDP and provides 80% of employment. Only 4.01% of the country is arable land, and a mere 0.34% used as permanent crop land, the lowest percentage in the Greater Mekong Subregion. Rice dominates agriculture, with about 80% of the arable land area used for growing rice. 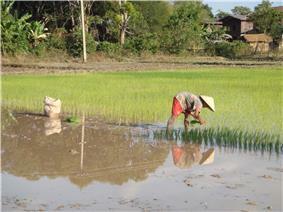 Approximately 77% of Lao farm households are self-sufficient in rice. The Lao economy depends heavily on investment and trade with its neighbours, Thailand, Vietnam, and, especially in the north, China. Pakxe has also experienced growth based on cross-border trade with Thailand and Vietnam. In 2009, despite the fact that the government is still officially communist, the Obama administration in the US declared Laos was no longer a Marxist–Leninist state and lifted bans on Laotian companies receiving financing from the US Export Import Bank. In 2011, the Lao Securities Exchange began trading. In 2012, the government initiated the creation of the Laos Trade Portal, a website incorporating all information traders need to import and export goods into the country. About 80% of Laos population practices subsistence agriculture. Laos and Vietnamese (SRV) troops were reported to have raped and killed four Christian Hmong women in The Centre for Public Policy Analysis. CPPA also said other Christian and independent Buddhist and animist believers were being persecuted. In October 1999, 30 young people were arrested for attempting to display posters calling for peaceful economic, political and social change in Laos. Five of them were arrested and subsequently sentenced to up to 10 years imprisonment on charges of treason. One has since died due to his treatment by prison guards, while one has been released. The surviving three men should have been released by October 2009, but their whereabouts remains unknown. However, Amnesty International has raised concerns about the ratification record of the Laos Government on human rights standards and its lack of co-operation with the UN human rights mechanisms and legislative measures which impact negatively on human rights. It has also raised concerns in relation to freedom of expression, poor prison conditions, restrictions on freedom of religions, protection of refugees and asylum-seekers and the death penalty. The Constitution that was promulgated in 1991 and amended in 2003 contains most key safeguards for human rights. For example, Article 8 makes it clear that Laos is a multiethnic state and is committed to equality between ethnic groups. The Constitution also has provisions for gender equality and freedom of religion, for freedom of speech, press and assembly. On 25 September 2009, Laos ratified the International Covenant on Civil and Political Rights, nine years after signing the treaty. The stated policy objectives of both the Lao government and international donors remain focused toward achieving sustainable economic growth and poverty reduction. The government of Laos, however, frequently does not abide by its own constitution and the rule of law, since the judiciary and judges are appointed by the communist party in Laos, and there is no independent judicial branch. Human rights violations remain serious according to Amnesty International, Human Rights Watch, The Centre for Public Policy Analysis and other independent human rights organisations and non-governmental organisations (NGOs). For the time being, countries willing to resettle the refugees are hindered to proceed with immigration and settlement procedures because the Thai administration does not grant them access to the refugees. Plans to resettle additional Hmong refugees in the United States have been complicated by provisions of President George W. Bush's Patriot Act and Real ID Act, under which Hmong veterans of the Secret War, who fought on the side of the United States, are classified as terrorists because of their historical involvement in armed conflict. The European Union, UNHCHR, and international groups have since spoken out about the forced repatriation. The Thai foreign ministry has said that it will halt deportation of Hmong refugees held in Detention Centres Nong Khai, while talks are underway to resettle them in Australia, Canada, the Netherlands and the United States. In their opposition of the repatriation plans, Democrat and Republican Members of Congress challenged the Clinton administration's position that the government of Laos was not systematically violating Hmong  Republicans called several Congressional hearings on alleged persecution of the Hmong in Laos in an apparent attempt to generate further support for their opposition to the Hmong's repatriation to Laos. Democratic Congressman Bruce Vento, Senator Paul Wellstone, Dana Rohrabacher and others also raised concerns. Following the Vue Mai incident, debate over the Hmong's planned repatriation to Laos intensified greatly, especially in the United States, where it drew strong opposition from many  Debate on the issue escalated quickly. In an effort to halt the planned repatriation, the Republican-led US Senate and House of Representatives both appropriated funds for the remaining Thailand-based Hmong to be immediately resettled in the United States; Clinton, however, responded by promising a veto of the legislation. In 1993, Vue Mai, a former Hmong soldier who had been recruited by the US Embassy in Bangkok to return to Laos as proof of the repatriation programme's success, disappeared in Vientiane. According to the US Committee for Refugees, he was arrested by Lao security forces and was never seen again. As many as 200,000 Hmong went into exile in Thailand, with many ending up in the USA. A number of Hmong fighters hid out in mountains in Xiangkhouang Province for many years, with a remnant emerging from the jungle in 2003. Some Hmong groups fought as CIA-backed units on the Royalist side in the Laos civil war. After the Pathet Lao took over the country in 1975, the conflict continued in isolated pockets. In 1977, a communist newspaper promised the party would hunt down the “American collaborators” and their families “to the last root”. On 17 May 2014 the Defense Minister, who was also Deputy Prime Minister, Major General Douangchay Phichit, with other top ranking officials was killed in a plane crash in the north of the country. The officials were to participate in a ceremony to mark the liberation of the Plain of Jars from the former Royal Lao government forces. Their Russian-built Antonov AN 74-300 with 20 people on board crashed in Xiengkhouang province. From its founding, until the present, the LPA receives significant support, training, advisers, troop support and assistance from the Socialist Republic of Vietnam and the Vietnam People's Army. The Lao People's Armed Forces (LPAF) is small, poorly funded, and ineffectively resourced; its mission focus is border and internal security, primarily in countering ethnic Hmong insurgent and opposition groups; with the Lao People's Revolutionary Party and the government, the Lao People's Army (LPA) is the third pillar of state machinery and, as such, is expected to suppress political and civil unrest and similar national emergencies. The LPA has upgraded skills to respond to avian influenza outbreaks; there is no perceived external threat to the state and the LPA maintains strong ties with the neighbouring Vietnamese military (2008). Laos has made particularly noteworthy progress increasing access to sanitation and has already met its 2015 Millennium Development Goal (MDG) target. Laos' predominantly rural (68%, source: Department of Statistics, Ministry of Planning and Investment, 2009) population makes investing in sanitation difficult. In 1990 only 8% of the rural population had access to improved sanitation. Access rose rapidly from 10% in 1995 to 38% in 2008. Between 1995 and 2008 approximately 1,232,900 more people had access to improved sanitation in rural areas. Laos' progress is notable in comparison to similar developing countries. This success is in part due to small-scale independent providers emerging in a spontaneous manner or having been promoted by public authorities. The authorities in Laos have recently developed an innovative regulatory framework for Public–Private partnership contracts signed with small enterprises, in parallel with more conventional regulation of State-owned water enterprises. Much of the country lacks adequate infrastructure. Laos has no railways, except a short link to connect Vientiane with Thailand over the Thai–Lao Friendship Bridge. A short portage railway, the Don Det—Don Khon narrow gauge railway was built by the French in Champasak Province but has been closed since the 1940s. In the late 1920s, work began on the Thakhek–Tan Ap railway that would have run between Thakhek, Khammouane Province and Tân Ấp Railway Station, Quảng Bình Province, Vietnam through the Mụ Giạ Pass. However, the scheme was aborted in the 1930s. The major roads connecting the major urban centres, in particular Route 13, have been significantly upgraded in recent years, but villages far from major roads can be reached only through unpaved roads that may not be accessible year-round. 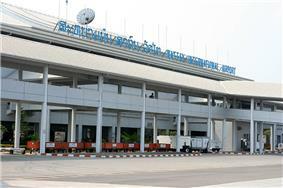 The main international airports are Vientiane's Wattay International Airport and Luang Prabang International Airport with Pakse International Airport also having a few international flights. The national carrier is Lao Airlines. Other carriers serving the country include Bangkok Airways, Vietnam Airlines, AirAsia, Thai Airways International, and China Eastern Airlines. Laos's first, French-written and monarchical constitution was promulgated on 11 May 1947, and declared Laos to be an independent state within the French Union. The revised constitution of 11 May 1957 omitted reference to the French Union, though close educational, health and technical ties with the former colonial power persisted. The 1957 document was abrogated on 3 December 1975, when a communist People's Republic was proclaimed. A new constitution was adopted in 1991 and enshrined a "leading role" for the LPRP. In 1990, deputy minister for science & technology Thongsouk Saysangkhi resigned from the government and party, calling for political reform. He died in captivity in 1998. The Lao People's Democratic Republic, along with China, Cuba, North Korea, and Vietnam is one of the world's five remaining communist states. The only legal political party is the Lao People's Revolutionary Party (LPRP). The head of state is President Choummaly Sayasone, who is also the General Secretary of the Lao People's Revolutionary Party. The head of government is Prime Minister Thongsing Thammavong, who is also a senior member of the Politburo. Government policies are determined by the party through the all-powerful eleven-member Politburo of the Lao People's Revolutionary Party and the 61-member Central Committee of the Lao People's Revolutionary Party. Important government decisions are vetted by the Council of Ministers. 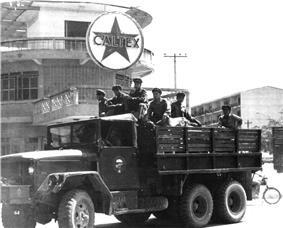 The Socialist Republic of Vietnam maintains significant influence over the Politburo of Laos and the one-party communist state apparatus and military. A 1992 government survey indicated that forests occupied about 48% of Laos' land area. Forest coverage decreased to 41% in a 2002 survey. Lao authorities have said that, in reality, forest coverage might be no more than 35% because of development projects such as dams, on top of the losses to illegal logging. Illegal logging is also a major problem. Environmental groups estimate that 500,000 cubic metres (18,000,000 cu ft) of logs find their way from Laos to Vietnam every year, with most of the furniture eventually exported to western countries. Milton Osborne, Visiting Fellow at the Lowy Institute for International Policy who has written widely on the Mekong, warns: "The future scenario is of the Mekong ceasing to be a bounteous source of fish and guarantor of agricultural richness, with the great river below China becoming little more than a series of unproductive lakes." In April 2011, The Independent newspaper reported that Laos had started work on the controversial Xayaburi Dam on the Mekong River without getting formal approval. Environmentalists say the dam will adversely affect 60 million people and Cambodia and Vietnam—concerned about the flow of water further downstream—are officially opposed to the project. The Mekong River Commission, a regional intergovernmental body designed to promote the "sustainable management" of the river, famed for its giant catfish, carried out a study that warned if Xayaburi and subsequent schemes went ahead, it would "fundamentally undermine the abundance, productivity and diversity of the Mekong fish resources". Neighbouring Vietnam warned that the dam would harm the Mekong Delta, which is the home to nearly 20 million people and supplies around 50% of Vietnam's rice output and over 70% of both its seafood and fruit outputs. The United Nations Development Programme warns that: "Protecting the environment and sustainable use of natural resources in Lao PDR is vital for poverty reduction and economic growth." A clickable map of Laos exhibiting its provinces and prefecture. Laos is divided into 17 provinces (khoueng) and one prefecture (kampheng nakhon) which includes the capital city Vientiane (Nakhon Louang Viangchan). Provinces are further divided into districts (muang) and then villages (ban). An 'urban' village is essentially a town. In 1993 the Laos government set aside 21% of the nation's land area for habitat conservation preservation. The country is one of four in the opium poppy growing region known as the "Golden Triangle". According to the October 2007 UNODC fact book Opium Poppy Cultivation in South East Asia, the poppy cultivation area was 15 square kilometres (5.8 sq mi), down from 18 square kilometres (6.9 sq mi) in 2006. On 2 December 1975, after taking control of the country, the Pathet Lao government under Kaysone Phomvihane renamed the country as the Lao People's Democratic Republic and signed agreements giving Vietnam the right to station armed forces and to appoint advisers to assist in overseeing the country. Laos was requested in 1979 by the Socialist Republic of Vietnam to end relations with the People's Republic of China, leading to isolation in trade by China, the United States, and other countries. In 1975 the Pathet Lao, along with the Vietnam People's Army and backed by the Soviet Union, overthrew the royalist Lao government, forcing King Savang Vatthana to abdicate on 2 December 1975. He later died in captivity. Between 20,000 and 70,000 Laotians died during the Civil War. Massive aerial bombardment against Pathet Lao and invading NVA communist forces was carried out by the United States to prevent the collapse of Laos' central government, the Royal Kingdom of Laos, and to prevent the use of the Ho Chi Minh Trail to attack US forces in South Vietnam and the Republic of Vietnam. "...Laos, the most heavily bombed country on earth...was hit by an average of one B-52 bomb-load every eight minutes, 24 hours a day, between 1964 and 1973. US bombers dropped more ordnance on Laos in this period than was dropped during the whole of the second world war." Due to the particularly heavily impact of cluster bombs during this war, Laos was a strong advocate of the Convention on Cluster Munitions to ban the weapons and assist victims, and hosted the First Meeting of States Parties to the convention in November 2010. In 1968 the North Vietnamese Army launched a multi-division attack to help the Pathet Lao to fight the Royal Lao Army. The attack resulted in the army largely demobilising, leaving the conflict to irregular forces raised by the United States and Thailand. Laos was also dragged into the Vietnam War since parts of Laos were invaded and occupied by North Vietnam for use as a supply route for its war against the South. In response, the United States initiated a bombing campaign against the North Vietnamese positions, supported regular and irregular anticommunist forces in Laos and supported South Vietnamese incursions into Laos. In 1960, amidst a series of rebellions, fighting broke out between the Royal Lao Army and the Pathet Lao. A second Provisional Government of National Unity formed by Prince Souvanna Phouma in 1962 proved to be unsuccessful, and the situation steadily deteriorated into large scale civil war between the Royal Laotian government and the Pathet Lao. The Pathet Lao were backed militarily by the NVA and Vietcong. In 1955, the US Department of Defense created a special Programs Evaluation Office to replace French support of the Royal Lao Army against the communist Pathet Lao as part of the US containment policy. Prince Phetsarath declared Laos' independence on 12 October 1945, but the French under Charles de Gaulle re-asserted control. In 1950 Laos was granted semi-autonomy as an "associated state" within the French Union. France remained in de facto control until 22 October 1953, when Laos gained full independence as a constitutional monarchy. In the late 19th century, Luang Prabang was ransacked by the Chinese Black Flag Army. France rescued King Oun Kham and added Luang Phrabang to the 'Protectorate' of French Indochina. Shortly after, the Kingdom of Champasak and the territory of Vientiane were added to the protectorate. 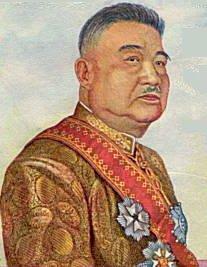 King Sisavang Vong of Luang Phrabang became ruler of a unified Laos and Vientiane once again became the capital. Laos never had any importance for France other than as a buffer state between British-influenced Thailand and the more economically important Annam and Tonkin. During their rule, the French introduced the corvee, a system that forced every male Lao to contribute 10 days of manual labour per year to the colonial government. Laos produced tin, rubber, and coffee, but never accounted for more than 1% of French Indochina's exports. 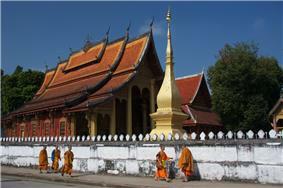 By 1940, around 600 French citizens lived in Laos. Most of the French who came to Laos as officials, settlers or missionaries developed a strong affection for the country and its people, and many devoted decades to what they saw as bettering the lives of the Lao. Some took Lao wives, learned the language, became Buddhists and "went native" - something more acceptable in the French Empire than in the British. With the racial attitudes typical of Europeans at this time, however, they tended to classify the Lao as gentle, amiable, childlike, naive and lazy, regarding them with what one writer called "a mixture of affection and exasperation." Chao Anouvong was installed as a vassal king of Vientiane by the Siamese. He encouraged a renaissance of Lao fine arts and literature and improved relations with Luang Phrabang. Under Vietnamese pressure, he rebelled against the Siamese. The rebellion failed and Vientiane was ransacked. Anouvong was taken to Bangkok as a prisoner, where he died. In 1520, Photisarath came to the throne and moved the capital from Luang Prabang to Vientiane to avoid a Burmese invasion. Setthathirat became king in 1548, after his father was killed, and ordered the construction of what would become the symbol of Laos, That Luang. Setthathirat disappeared in the mountains on his way back from a military expedition into Cambodia and Lan Xang began to rapidly decline. It was not until 1637, when Sourigna Vongsa ascended the throne, that Lan Xang would further expand its frontiers. 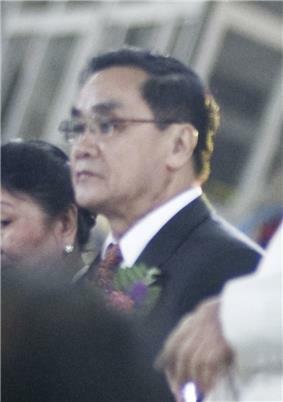 His reign is often regarded as Laos's golden age. When he died, leaving Lan Xang without an heir, the kingdom divided into three principalities. Between 1763 and 1769, Burmese armies overran northern Laos and annexed Luang Phrabang, while Champasak eventually came under Siamese suzerainty. Laos traces its history to the kingdom of Lan Xang (Million Elephants), founded in the 14th century, by a Lao prince Fa Ngum, who with 10,000 Khmer troops, took over Vientiane. Ngum was descended from a long line of Lao kings, tracing back to Khoun Boulom. He made Theravada Buddhism the state religion and Lan Xang prospered. Within 20 years of its formation, the kingdom expanded eastward to Champa and along the Annamite mountains in Vietnam. His ministers, unable to tolerate his ruthlessness, forced him into exile to the present-day Thai province of Nan in 1373, where he died. Fa Ngum's eldest son, Oun Heuan, came to the throne under the name Samsenthai and reigned for 43 years. During his reign, Lan Xang became an important trade centre. After his death in 1421, Lan Xang collapsed into warring factions for the next 100 years. In 2009 an ancient human skull was recovered from the Tam Pa Ling cave in the Annamite Mountains in northern Laos; the skull is at least 46,000 years old, making it the oldest modern human fossil found to date in Southeast Asia. Archaeological evidence suggests agriculturist society developed during the 4th millennium BC. Burial jars and other kinds of sepulchers suggest a complex society in which bronze objects appeared around 1500 BC, and iron tools were known from 700 BC. The proto-historic period is characterised by contact with Chinese and Indian civilisations. From the fourth to the eighth century, communities along the Mekong River began to form into townships called muang. In the Lao language, the country's name is "Muang Lao" (ເມືອງລາວ) or "Pathet Lao" (ປະເທດລາວ): both literally mean "Lao Country". The French, who united the three Lao kingdoms in French Indochina in 1893, named the country as the plural of the dominant and most common ethnic group (in French, the final "s" at the end of a word is usually silent, thus it would be pronounced "Lao").